This weekend we went to Ventimiglia on the French/Italian border, where many refugees find themselves stranded since France tightened controls in the first half of 2017. 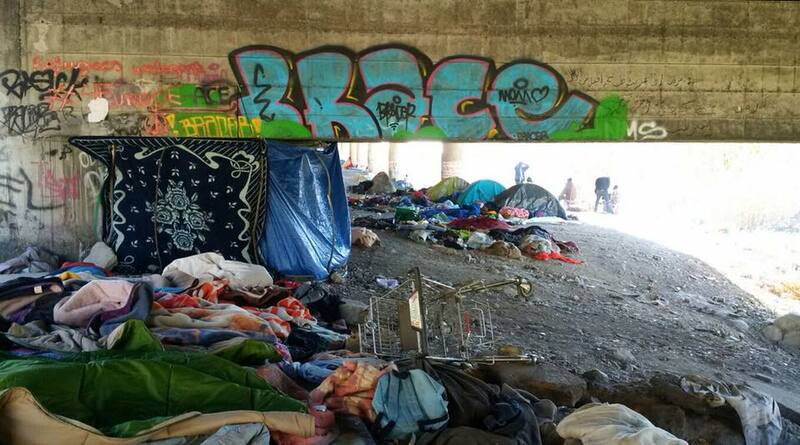 At present there are around 200 people there, although numbers were much higher in summer months, and most now sleep under a big motorway bridge. Compared to Calais the atmosphere feels slightly more relaxed. While the locals may not be thrilled by having refugees there sleeping rough, there is less overt pressure from the police. However, having spent so much time in Calais I find this place unbearably sad. The refugees here still have hope. They have gone through much to get here – one man told me that crossing the desert was worse than crossing the Mediterranean in a rubber boat; that does not bear imagining – the problem is they think that is now behind them; that all they need to do is to ‘cross’ and either France or the UK will help. But crossing is not so easy. Once the border closed in 2017 migrants began to loose their lives here, either on the mountains, roads or rail tracks. France’s border patrols are hard to miss, and now more and more are taking greater risks on the freezing heights of the Italian Alps. And I am not so optimistic about their reception in France or the UK. France has committed to send as many back to Italy as possible, and a lot of those I spoke to have fingerprints in Italy. If they do get to Calais, all they do face is another, tougher, border and another, harder, wait. But it’s not like they can go back, whatever some people may think.